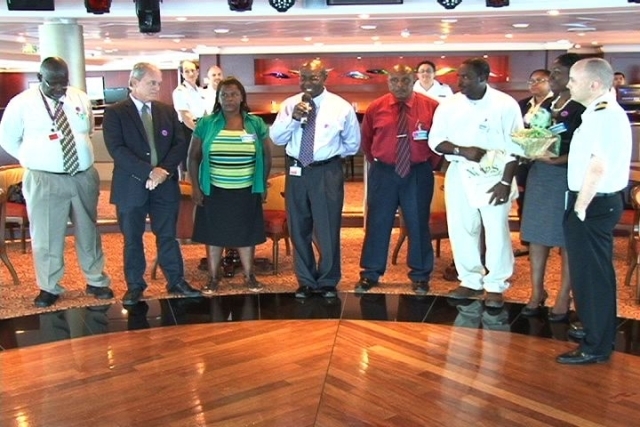 A small welcoming party made up of Nevis Air and Sea Ports Authority (NASPA), Ministry of Tourism officials, the Department of Information and Agents Delisle Walywn, boarded the cruise liner and met with Captain Johanis Tysee. Tourism Advisor Mr. Alistair Yearwood who spoke on behalf of the Nevis Island Administration (NIA) and people of Nevis welcomed the cruise ship to Nevis. “On behalf of the Government, our Premier Hon. Joseph Parry, the people of Nevis we would like to thank you and welcome you to the shores of Nevis and hopefully this is not just the first visit but it will be one of many visits to come of the Azamara. “I trust that you and your crew and passengers will enjoy the island and go away with smiles on your faces. Thank you very much for coming and welcome to Nevis,” he said. 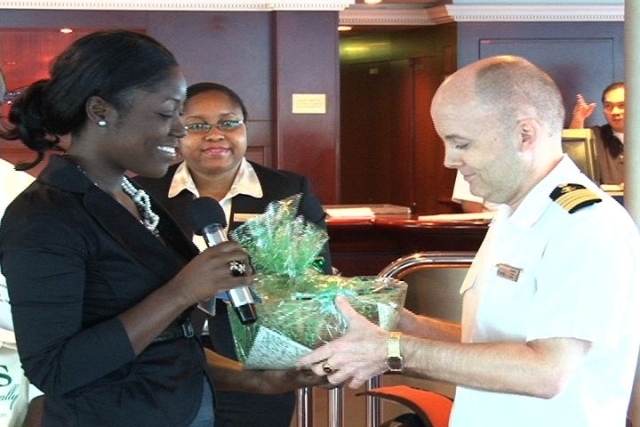 Meantime, while presenting a gift basket to Captain Tysee, Marketing Officer at the Ministry of Tourism Ms. Tamika Lawrence said the Ministry was pleased that Azamara had chosen the island as its port of call and were hopeful of its return for many more visits to the island. In response, the Captain said Azarama Club Cruises was pleased to visit the island and assist with the island’s local economy. He registered his hope that the ship would return to Nevis with more guests well into the future. He said he had been to Nevis several times before on another vessel and used his prior knowledge of the island to give guests an insight into where they should visit to make their stay on Nevis enjoyable. Later, in response to a question in an interview with the Department of Information, Captain Tysee said though he was not responsible for drawing up the ship’s itinerary, he believed that his experience and that of other executives who had visited the island in the past may have been responsible for the island’s inclusion. “I am not the one laying out the itineraries but I came from a different company and a few other people now with Azamara in Management they came from the previous company I was with and have great knowledge of Nevis and what it has to offer and that’s one of the reasons we are here. “The person in charge of itinerary planning he has been to Nevis like me numerous times and he loves the island and so Azamara Club Cruses we decided to try it out with a bigger ship and more guest and hopefully more business for the local economy,” he said. Meantime, Head of Security at the Nevis Air and Sea Ports Authority and Port Facility Security Officer (PFSO) Mr. David Hendrickson said the ship’s visit prompted an increase in staff in and around the Charlestown Port to ensure all security measures were adhered to. “We did not increase our security level but we operate on Level I but we increase our awareness by adding more staff around the town today. Also we increase on our patrols with our vessel to make sure there is no interception of vessels from sea towards the ship. On land we implemented more officers on shore to make sure that everything goes smoothly. “In fact one of our procedures as the ship came for the first time we have to sign a Declaration of Security between the ship and the Port to make sure all the measures we say we are going to do we have to do them. So all the measures we have to implement because we have signed off on a declaration of security,” he said. The Azamara Journey which was bought over by Royal Caribbean Celebrity Cruise Lines in 2009 is next scheduled visit Nevis on March 30th, 2011.